o avoid an excessive cells discharging is advisable to use LiPo alarm. 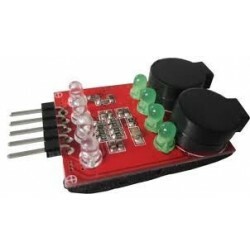 When dangerous limit voltage level per cell will be reached LiPo alarm gives sound. price. The offer includes high capacity packs designed with limited space replicas in mind - new packs are similar to a lighter in size! frequently, without the need to be fully discharged. Frequent charging is beneficial for every type of a battery. 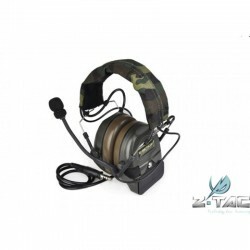 occur, which lead to a deterioration of the pack’s properties including a permanent damage and, in extreme cases, fire. 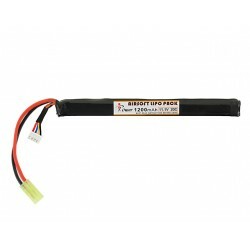 Unused LiPo pack should be charged to an average of 70%. charging with a service connector, which most LiPo packs have (a good LiPo charger features an in-built balancer). Capacity: 1200 mAhVoltage: 7,4 VMaximum discharge power (semi fire): 24AMaximum discharge power (auto fire): 48A NOTICE! Batteries are covered only by starting warranty. 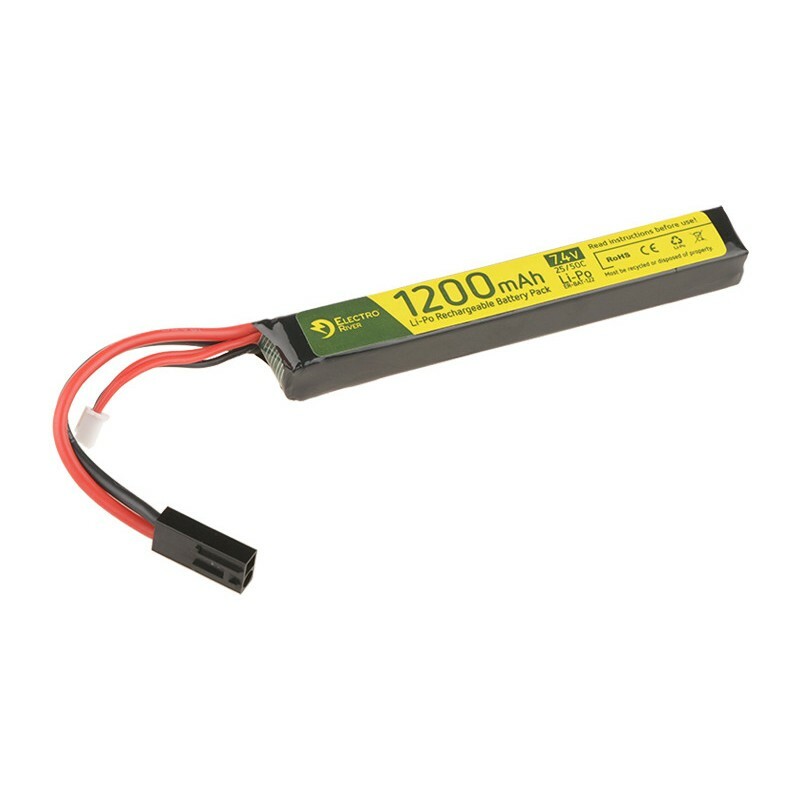 Name LiPo 7,4V 2200mAh 20/40C Cell Type LiPo Battery Capacity [mAh] 2200 Battery Voltage [V] 7,4 Plug Type Tamiya small Battery size [mm] 15x35x103 Number of Cells 2 NOTICE! Batteries are covered only by starting warranty. 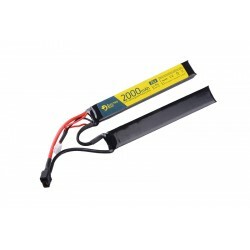 Name LiPo 7,4V 2200mAh 20/40C Cell Type LiPo Battery Capacity [mAh] 2200 Battery Voltage [V] 7,4 Plug Type DEAN Battery size [mm] 15x35x103 Number of Cells 2 NOTICE! 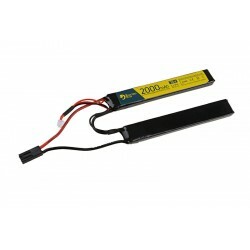 Batteries are covered only by starting warranty. 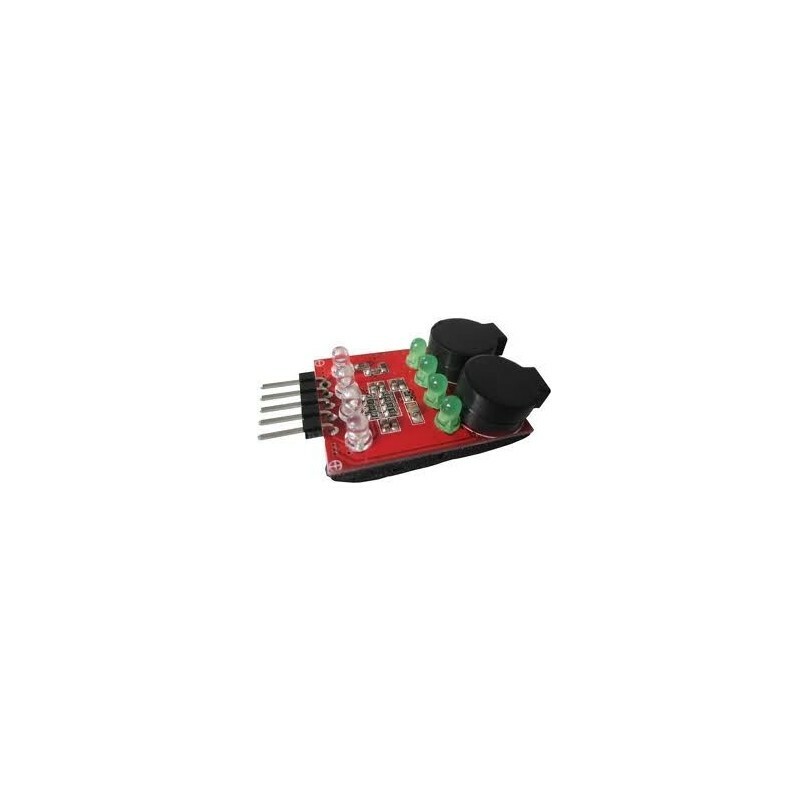 Accumulator type: metal Accumulator connector type: small Tamiya Accumulator cells type: lithium Accumulator capacitance: 1500 mAh Length: 125 mm Width: 20 mm Accumulator voltage: 11,1 V NOTICE! 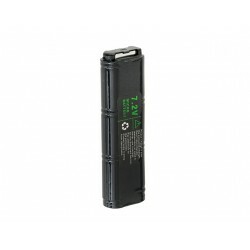 Batteries are covered only by starting warranty. Cell Type LiPo Battery Capacity [mAh] 2000 Battery Voltage [V] 7,4 Plug Type DEAN Battery size [mm] 10x21x126 Number of Cells 2 NOTICE! Batteries are covered only by starting warranty. NOTICE! 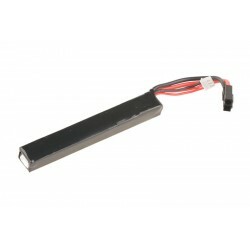 - Batteries are covered only by starting warranty. - Guns not included. This compact 7.4V Li-Po battery with its slim split-cell construction, lets them be placed practically anywhere in a AEG, even inside stock tubes and SOPMOD/Cranestocks. Despite its small size it still packs 1300mAh. It comes in a handy storage box. NOTICE! Batteries are covered only by starting warranty. 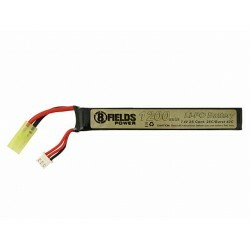 Weight: 160 g Accumulator type: metal Accumulator connector type: small Tamiya Accumulator cells type: lithium Accumulator capacitance: 2300 mAh Length: 103 mm Width: 34 mm NOTICE! Batteries are covered only by starting warranty. 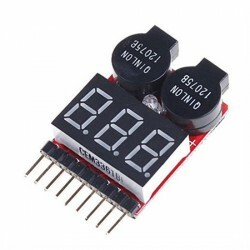 Accumulator connector type: small Tamiya Accumulator cells type: lithium Accumulator capacitance: 2100 mAh Length: 103 mm Width: 34 mm Accumulator voltage: 7,4 V Height: 16 mm NOTICE! Batteries are covered only by starting warranty. 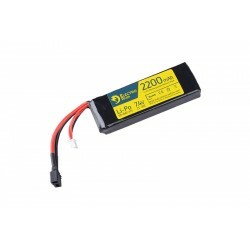 Name LiPo 7,4V 2000mAh 15/30C Cell Type LiPo Battery Capacity [mAh] 2000 Battery Voltage [V] 7,4 Plug Type Tamiya small Battery size [mm] 10x21x126 Number of Cells 2 NOTICE! Batteries are covered only by starting warranty. 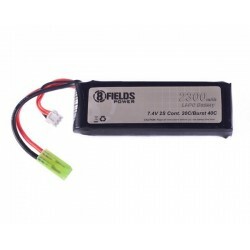 A small 7.2V 500mAh. 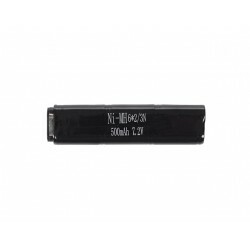 battery for electric airsoft handguns like G18C, CZ99 and STI Classic, also it fit CYMA electric pistols. CM030, CM121, CM122, CM123, CM125, CM126 NOTICE! 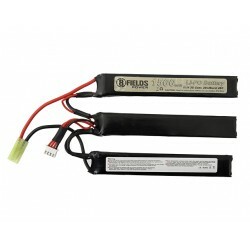 Batteries are covered only by starting warranty.